Fame can be brilliant. It can bring wealth, opportunity, security. It can give its recipient a feeling of recognition, of acceptance, of confidence, even of love. If used correctly by those who possess it, it can be used to highlight issues and situations in need of improvement, and can be used for the greater good. But it can also be bad. Corrosive. All consuming. Toxic. It can be fickle, easily lost. It can vanish as quickly as it appears. This is exactly the case for the main protagonist of Billy Wilder’s classic film noir Sunset Boulevard. 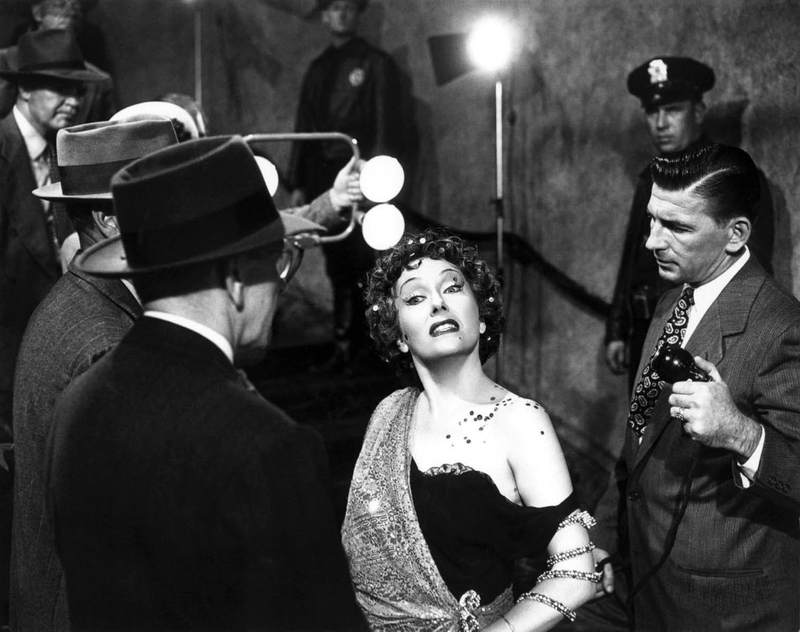 Norma Desmond, the forgotten silent movie star played brilliantly by real life silent movie queen Gloria Swanson – life imitating art in one of the film’s many nods to reality – was, quite simply a mega star. As her butler, Max, explains to Joe Gillis (a delightfully cynical William Holden): “she was the greatest of them all.” However, many years have passed since then, and she now lives in obscurity in her opulent mansion on Sunset Boulevard. Joe himself is a struggling screenwriter who has become disillusioned with Hollywood and its unpredictability. Broke, out of work and desperate, he suddenly finds himself on the run from two debt collectors. Ducking into a random driveway, he stumbles upon Norma’s home, and finds himself slowly drawn into her world. And what a world it is. Of course, Swanson herself was incredibly brave in her acceptance of the role. Billy Wilder offered it to many actresses, including Greta Garbo, Mae West, Pola Negri, Mary Pickford and Norma Shearer, but, perhaps understandably, received flat refusals from all. Swanson was different. Wilder approached her about the film at the suggestion of George Cukor, who urged her to take the dream role. On the surface, the two are very similar. Swanson, like Desmond, was a huge celebrity. One of the most popular film stars of her day, Swanson was the highest paid actress of the 1920s, reportedly earning over $8,000,000 – around $90,000,000 today, adjusted for inflation – between 1918 and 1929 alone. At the peak of her career in 1925, she regularly received 10,000 fan letters a week and lived in a palatial mansion on Sunset Boulevard. But when sound arrived in Hollywood, Swanson found it difficult to transition to talking pictures. After a series of box office flops, she retired from film. This is where the similarities to Desmond end. Swanson accepted her retirement from the big screen graciously, moving to New York City and working in radio and television, as well as taking on a variety of other projects. She was not looking for a comeback role of any kind, but found the project interesting and decided to sign up. What follows is a magnificently foreboding and gripping journey which focuses on Norma’s attempt at a comeback and the slow unravelling of Joe’s life as he is pulled further and further into her deluded fantasy world. Franz Waxman’s dramatic score mingles elements of tango music and the music of films of the 1920s and 30s with more contemporary styles in order to contrast Norma and Joe’s personalities; she is living in a past where she tangoed with Rudolph Valentino, while he is in the present, always living in the moment. Wilder’s screenplay, co-written alongside Charles Brackett and D.M. Marshman Jr., is merciless in its depiction of Hollywood; so biting, in fact, that the filmmakers shot the picture under the code name “A Can of Beans” in order to avoid any potential problems with the studio. Disturbing and blackly funny in equal measure, the script does not hesitate in its representation of the artificiality of Hollywood or its lack of care in casting off people who no longer suit its needs. The casting of real life figures from the film industry adds great realism to the film, making it seem even truer to life than it already is. Cecil B. DeMille appears as himself, meeting Norma as she visits Paramount – just one product of this visit is another brilliant deadpan line for Swanson, addressed to a guard at the gate: “Teach your friend some manners; tell him that without me, he wouldn’t have any job, because without me, there wouldn’t be any Paramount studios” – to talk about her script. As well as this, silent film stars Buster Keaton, Anna Q. Nilsson and H. B. Warner make cameos as themselves; described by Joe as Norma’s “waxworks”, they play cards with her once a week, showing that she is not the only relic forgotten by unfeeling Hollywood. Perhaps the most tragic casualty of Hollywood in the film, other than Norma herself, is Max. Played by Erich von Stroheim, who had himself directed Swanson in 1929 in the unfinished Queen Kelly, a tumultuous production which arguably precipitated the beginning of the decline of Swanson’s film career, Max reveals that he was Norma’s first husband and was the one who discovered her as a girl. He now cannot bear to leave her and instead maintains his position as a servant in order to remain close to her. The film was met with considerable praise upon release and was nominated for eleven Academy Awards – including Best Picture, Best Director, Best Writing, Story and Screenplay as well as Best Actor and Actress for Holden and Swanson – eventually winning three. Time magazine rightly summed it up as a film about “Hollywood at its worst told by Hollywood at its best.” Indeed, it is often described as the best film ever made about Hollywood. Yet it is not only a great film about Hollywood and the film industry. Sunset Boulevard is also one of the best films ever made in general. A masterpiece of cinema, it highlights the dark side of fame, the dangers of obsession and the terrible consequences which can occur when desperation and delusion take over the mind.